Umpiring is believed to be the toughest job in cricket. An umpire must have a fantastic vision and accurate findings to give right decisions. We will highlight top ten finest cricket umpires who are best known for their extraordinary aptitudes and fantastic umpiring careers. Let’s begin! The English umpire Ian Gould ranks at number 10 in our list. Born in 1957, the umpire has had a successful career in cricket umpiring. He has also served as a left-handed wicket-keeper batsman in English cricket team. Besides, Gould has represented Arsenal as a goalkeeper, that’s why he is famous as Gunner. He umpired his first ODI’ in 2006 a game played between England and Sri Lanka whereas his debut test was a game played between South Africa and Bangladesh in 2008. Gloud has umpired 30 tests and 73 ODIs as far as this. Our 9th slot goes to kiwi umpire Tony Hill who started his international umpiring career in 1998 with an ODI match that was played between New Zealand and Zimbabwe. He umpired his first test match played between New Zealand and Bangladesh in 2001. ICC drafted him into its Elite Umpire panel in 2009. Tony has a great career as one of the finest umpires and he still umpires. Daryl John Harper started his umpiring career in 1983. He was the first Australian umpire who was chosen for the Elite Umpires Panel of the ICC. Having spent a long era as an umpire, Harper attained a perfect career in the sport and retired in 2011. 62yrs old Harper has 94 test matches and 174 ODIs under his belt. He indeed is an easy pick for the list of top ten finest cricket umpires. At number 7, we have Steve Bucknor who was born in 1946. At first, Bucknor served as a football referee and subsequently started umpiring in cricket. His debut test match as an umpire was a game played between West Indies and India in 1989 whereas he umpired his first ODI in the same year. Buckor has umpired 128 tests and 181 ODIs and retired in 2009. 6. Aleem Dar: The most victorious umpire of the world of cricket, Aleem Dar ranks at number 6 in the top ten best umpires of cricket’s world. He debuted as an international umpire in 2000 with an ODI played between Sri Lanka and Pakistan. Soon in 2002, ICC chose him in its panel of umpires. Aleem Dar has umpired 74 tests and 151 ODIs up to now and still umpires. The umpire has the honor of winning three consecutive ICC Umpire of the Year awards from 2009 to 2011. One of his brilliant performances can be seen in 2011’s World Cup where he gave 15 consecutive correct judgments that succeed a battle in opposition to DRS challenges. 5. Billy Bowden: the kiwi umpire Billy Bowden stands out at number 5 in the top ten finest umpires of the world. Born in 1963, he umpired his first ODI that was played between New Zealand and Sri Lanka in 1995.He umpired his first test in 2000 which was a game played between New Zealand and Australia. As yet, Billy has umpired 75 One Days and 181 test matches whereas the number of his T20s reaches to 19. Billy is distinguished for his unique and fantastic umpiring styles, such as his amazing styles of dancing jig to precede his SIX sign and bending his index finger to announce a player out. 4. Rudi Koertzen: at number 4, we have Rudi Koertzen who debuted as an umpire in 1981 with domestic games and then joined international cricket in 1992 by umpiring his first ODI that was played between South Africa and India. His first test match as an umpire was again between the South Africa and India in 1992. Rudi was an umpire of high level who also happens to be a part of Elite Umpires Panel. He has umpired 108 tests and 206 ODIs matches. 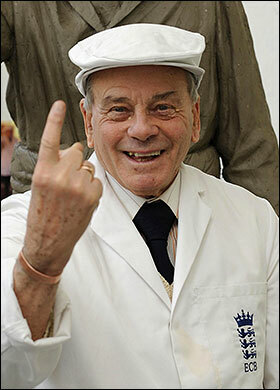 Rudi is famous for raising his finger to declare a player out with his slow-death action. A former Australian umpire Simon Taufel had witnessed a wonderful period of his professional days in the world of cricket. He umpired his first ODI in 1999 which was played between Australia and Sri Lanka whereas his first test match as an umpire was played between Australia and West Indies in 2000. Born on 21 January 1971, Taufel has achieved five consecutive awards (2004-2008) for the best umpire by the ICC. He has officiated 74 test matches, 174 ODIs and 34 Twenty 20s in his overall umpiring career. As one of the finest umpires, Taufel retired from international cricket on 26 September 2012. He now would be working as Umpire Performance and Training Manager. David Shepherd sparkles at number 2 in our list of the best cricket umpires of the world. Shepherd played English county for 14 years as a middle-order batsman. Subsequently he went on for umpiring in 1981 and gave his first appearance as an empire in 1983’s World cup. Shepherd umpired his first test match of the Ashes Series in 1985. He was an optimistic, vivacious, and lively umpire amongst the professionals of cricket. The great umpire has 172 One Day International whereas 92 test matches on his credit. He also has umpired World Cup finals of 1999, 2003, and 2007. David Shepherd was suffering from lung cancer for a long time which ultimately caused his death in 2012. Our number 1 position goes to Dikie Bird, the greatest umpire of the cricket world. Nobody knew that a school failure would come out as the greatest umpire of all time. His first love was football which he had to leave due to an injury, and he then moved to county cricket for Yorkshire. Bird served as a coach for a specific period before working as an umpire. His first umpiring activity was for a test match which was battled between England and New Zealand. Sine then he has umpired 66 test and 69 ODIs matches hitherto whereas there are three world cup finals of 1975, 1979, and 1983 on his umpiring record. The umpire has also attained the OBE (the Officer of the Order of The British Empire) for his extraordinary involvement to the sport. Having earned incredible respect, honor and praise for his most excellent umpiring skills, Bird ranks number 1 position in the world of Cricket Umpiring.